Heat would scald primordial soup! Experiments testing how quickly organic molecules decompose at high temperatures have poured cold water on a popular idea that life may have originated in vents of superheated water on the ocean floor. ‘This is probably the most unlikely area for the origin of life to occur’, says Jeffrey L. Bada from the University of California in San Diego. In the 1970s, researchers discovered vents near ocean ridge crests that spew out jets of water at superhot temperatures. The heat comes from chambers of molten rock below the ocean floor. Some have suggested that in the early oceans, heat from similar vents might have helped convert simple molecules into the first living organisms. To test the theory, Bada and colleague Stanley L. Miller measured how amino acids—the building blocks of protein subunits called peptides—coped with vent conditions. They found the amino acids decomposed rapidly, some within seconds. Bada says that even if amino acids could survive the vent out-flow, they could not leave joined together spontaneously to form peptides because this reaction requires dry conditions. Vol. 134, 1988 (p. 117). 18 August, 1988 (pp. 609-611). If origin - of- life researchers have effectively dispelled the idea that life could have begun in superheated water on the ocean floor, has it led them to consider supernatural creation? Not at all. Miller now speculates that it probably occurred in the atmosphere, and then in lagoons, lakes or cool parts of the ocean. An American astronomer believes he has calculated where a tenth planet lies in our solar system, beyond the orbit of Pluto. Dr Robert Harrington, of the US Naval Observatory, believes the planet lies in a broad region covered by the constellations of Sagittarius and Scorpio. He bases his belief on measurements of the orbit of Uranus, which seem to indicate an unseen object beyond Pluto’s orbit, whose gravitational influence is tugging Uranus from its predicted path. He thinks the diameter of this ‘Planet X’ is about 2.5 times that of earth. A tenth planet, was proposed as early as the mid-1800s by French astronomer Urbain Le Verrier, who also predicted the discovery of Neptune. This tenth planet, called Vulcan, was supposedly seen ’ by numerous observers but was never scientifically established. But it was said to lie between Mercury and the sun - the opposite end of the solar system to where ‘Planet X’ is believed to be. The first of a series of new scientific maps, ‘graphically depicting Australian geological evolution over 600 million years’, has recently been released. The first volume of the 10 volume series deals with the Cambrian period (600 million years ago). The other nine volumes NMI be published over the next year. Announcing the release of the maps, the Minister for Resources, Senator Pete Cook, said the maps would be ‘of special interest to the petroleum and minerals industry as an aid to exploration and as the basis for the broad scale assessment of undiscovered resources.’ Senator Cook said the maps provided insights into the evolution of the Australian continent. They resulted from a three-year study by the Bureau of Mineral Resources, with financial support from 14 resource companies. Many geologists regard the geological evolution of australia as a fact, but that doesn’t make it a fact. Creationists do not question the existence of the rocks, because they are facts. But we question the tendency of many geologists to promote as a fact the interpretation of how the rocks got there. Marking the positions of rock layers on paper to produce a geological map is factual, for anyone can check the map for themselves by looking for the same rock layers. However, the labels placed on the map (e.g. Cambrian, Devonian, etc.) are an interpretation. A better interpretation would mean that industry is even better equipped to find minerals. More attention should therefore be given to determining the best model for explaining the rock layers. The end product would be better maps providing much better value for money and better exploration results. Some species of bees pollinate flowers by embracing their anthers, closing their wings, and buzzing. This buzz discharges a cloud of pollen, some of which settles on the bee. Sally Corbet and colleagues, at Cambridge University, have confirmed that this method of collecting pollen occurs by design rather than as a result of a happy accident. The researchers found that the bumblebee, Bombus terrestris, emits a high-frequency buzz specifically to gather pollen from the kiwi fruit in new Zealand. The buzz is significantly higher than the usual buzz it emits while flying. The kiwi fruit produces no nectar, and the sole purpose of the bee’s visit is to collect pollen. The kiwi fruit produces many anthers in a tufted arrangement, rather like a shaving brush, to assist buzz pollination. Other flowers also enhance buzz pollination, and recent research indicates that this effective insect/flower relationship is widespread. Does the Face on Mars Have Teeth? ‘The image enhancement results indicate that a second eye socket may be present on the right, shadowed side of the face’. A second eye socket? What next? ‘Fine structure in the mouth suggests teeth are apparent.’ Teeth? What next? Pat Jones, writing in New, Scientist, says a second Martian face exists. He says it has symmetry, two eyes, a nose, a mouth, a chin, and even a comical shadow to provide a beard. Vol. 27, 1988 (p. 1926). August 25, 1988 (p. 62). Gene Cordell, an imaging specialist, said in 1984 of certain image enhancement techniques: ‘There are some who believe that it can bring out detail in a picture that ",as not apparent in the raw, data. This is mistaken’ (see The Face on Mars, by RandolFo Pozos, Chicago Review Press, Chicago, 1986, p. 31). This immediately leaves the ‘second eye’ and the teeth’ with no foundation. Fin ally, let’s learn the lesson of the honeycomb structures that suggested to some that a city once existed on mars near the ‘face’. These structures were so geometrically perfect - like honeycomb cells - that some people had no doubt they were architectured and engineered by intelligent beings. Gene Cordell investigated, and found the honeycombs ",ere not on Mars - they were part of the film processing technique! An analysis of the fossil record by evolutionists reveals some ‘unexpected patterns in the origin of major evolutionary innovations’, according to an article by Roger Lewin in the journal Science. The most interesting ‘unexpected pattern is the gross imbalance between the diversification of life in the socalled Cambrian explosion (close to 500 million years ago) and that following the great Permian extinction more than 200 million years ago. In both instances ‘biological innovation’ is said to have been intense. However, it is noted that all existing (and many extinct) phyla arose during the Cambrian explosion and none followed the Permian extinction. ‘Why’, the article asks, ‘in subsequent periods of great evolutionary activity when countless species, genera, and families arose, have there been no new animal body plans produced, no new phyla?’ Scientists contemplating these matters seem to concur that microevolution (small changes), which supposedly gives rise to new species, cannot manage the bigger task of macroevolution (major changes supposedly leading to completely different types of creatures) - in particular the creation of new phyla at the beginning of the Cambrian. Science Frontiers, November-December, 1988 (p. 2). Vol. 241, 1988 (p. 20). The obvious answer to why all the major kinds of creatures appeared around the same time is because they were created by God around the same time, as Genesis says. They did not evolve at all. Famous fossil-hunter Richard Leakey visited, Australia in September this year to open an exhibition in sydney on human evolution. The exhibition, in the Australian Museum, was called Tracks Through Time: The Story of human Evolution. Many of Leakey’s discoveries are represented in the exhibition, and he commented that the display was amoung the top three of its type in the world. One of the displays in the museum is headed ‘Evolution is a fact’, although comments we received say it fails to prove this assertion. In an article about Leakey in The Sun Herald (Sydney) on September 18, 1988, Leakey dismissed creationists as I a bunch of flat-earthers’ - even though we don’t believe in either a flat earth or evolution. The article also claimed that a skull Leakey found in 150 pieces confirmed his father’s theory ‘that our earliest ancestor was a tool-using, meat and vegetable eating ape-man’, although it does not tell us how the skull confirmed this, particularly the point about tool-using. ‘For us to know where we come from will prove the commonality of our species’, Leakey was reported as saying. ‘We are all one. That will put the finger on the stupidity of those South African Boers and all the other bigots and racists,’ he said. Although carbon-dating of the Shroud of Turin-regarded by some as the burial cloth of Jesus Christ - has dated the shroud as only 600 or 700 years old, some scientists and theologians believe the dating is flawed and that the shroud is not a fake. New Scientist, October 22, 1988 (p. 25). The Courier-Mail, October 15, 1988 (p. 6). The carbon-dating tests may be inaccurate, but a more serious doubt to the cloth’s authenticity is found in Scripture. It is clear in the New Testament and from Jewish burial customs that several pieces of cloth were used in Christ’s burial-not one large sheet like the shroud. In John 20:5-7 we see that there was a separate piece wrapped about Christ’s head-yet the Shroud of Turin depicts a face on the sheet. Scripture indicates that Jesus was bound with linen strips, not wrapped with a cloth (see John 19.-40). These and other- problems apart from the carbon-dating results seem to indicate that great caution should be used in accepting the shroud as genuinely having wrapped the body of Christ. Can you Solve the Mystery of Baalbek? The ruins of the greatest temple the Romans ever tried to construct lie in the town of Baalbek in eastern Lebanon. However, a mystery surrounds one of Baalbek’s principal monuments, and recent research has thrown no light on a solution. A great assemblage of precisely cut and fitted stones, today called ‘the temple’, was found ready-made when the ancient Romans arrived in the area. On the stone foundation of this temple the Romans built their Temple of Jupiter. No one seems to know the purpose of the much older temple beneath the Roman work. Researcher Jim Theisen says the temple is 2,500 feet long (762 metres) on each side, making it one of the largest stone structures in the world. Some 26 feet (eight metres) above the structure’s base, are three of the largest stones ever employed by man. Each is 60 feet long (I 8 metres), and from the density of limestone the weight has been estimated at more than 1.2 million pounds (544 tonnes). It is believed these immense stones were cut, dressed and moved from a quarry about a kilometre away. At the quarry is a limestone monolith that weighs about two m illion pounds (nearly 1,000 tonnes)l The largest stones in the Great Pyramid weigh only a small fraction of this. Today, there is no evidence of a road connecting the quarry and temple. Even if a road existed, logs employed as rollers would have been crushed to a pulp. Obviously, someone way back then knew how to transport million-pound stones. But how? No one seems to know. No. 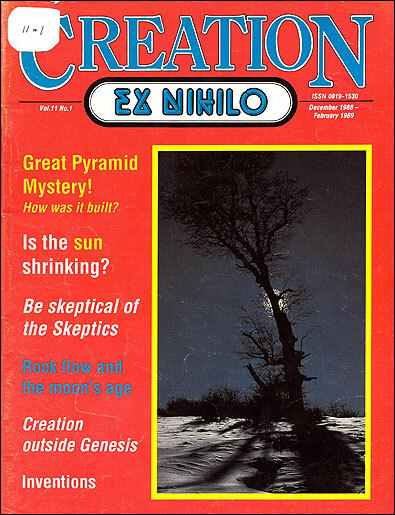 55, 1988 (p. 5). Gravity Law in Doubt? Definitely Maybe! Preliminary results from a gravity experiment within the Greenland ice cap may lend support to the existence of a much-disputed fifth force in nature. But physicists say the results so far are not definite enough to claim that Newton’s law of gravity needs altering. In 1987, investigators lowered a sensitive meter into a borehole two kilometres deep in the ice. They found gravity was about 3 per cent stronger than expected, according to experimenter Mark E. Ander of the Los Alamos National Laboratory in New Mexico. In the experiment, the researchers compared their measurements with predictions based on the standard Newtonian law of gravity, called the inverse square law. The results indicated that ‘there is an apparent violation of the inverse square law’, says Ander, who has not finished analysing results.